In my post on Ankara, I asked you to look at the photo to consider which character was you and which character you would like to be you. In this post, I wanted to share why I picked this photo for my Contact page. This picture reminds me of traveling. The iguana has stopped to look ahead. It didn’t wait until it was right at the top of the rock but stopped a bit before, while still on its way. And it stopped where it could admire the view. While ever on the go, I like to take time to stop along my way and admire my surroundings. It has to do with mindfulness and also curiosity. 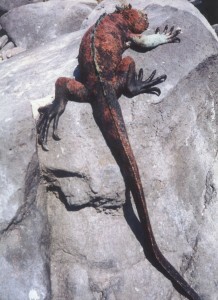 The iguana looks like it could be drumming the rock with its claws, keeping time to a song in its head. (Perhaps it is waiting for the next ferry.) Travel can involve days with much waiting in anticipation. Habitual travelers develop a proper attitude and a battery of coping skills. Resilience helps them bounce back and flexibility lets them adapt game plans. Does the iguana remind you at all of traveling? How so?